Mukurtu CMS fully supports the 13 Traditional Knowledge (TK) Labels developed by Local Contexts. Users can use the stock, uncustomized text provided with the labels, or can use custom text at either the site-wide, or community-specific level. For more information about using TK Labels, read the support article What are Traditional Knowledge Labels? Learn more about Traditional Knowledge Labels at Local Contexts. To use the stock text, no action is needed - the default text will display along with the visual labels. 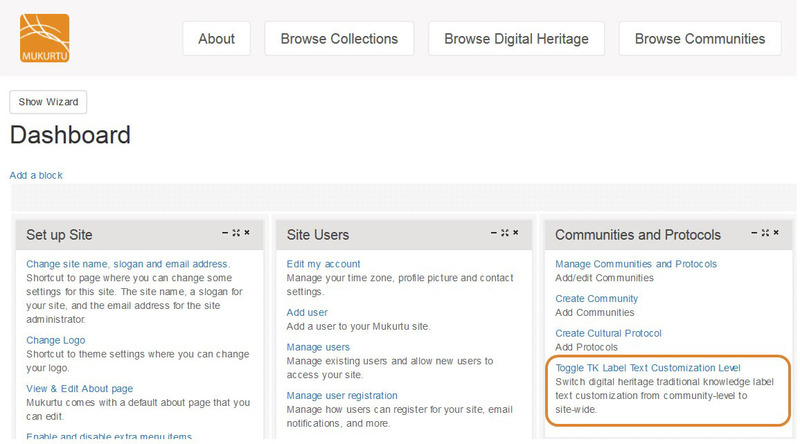 Mukurtu CMS comes with the option to customize label text site-wide toggled by default. 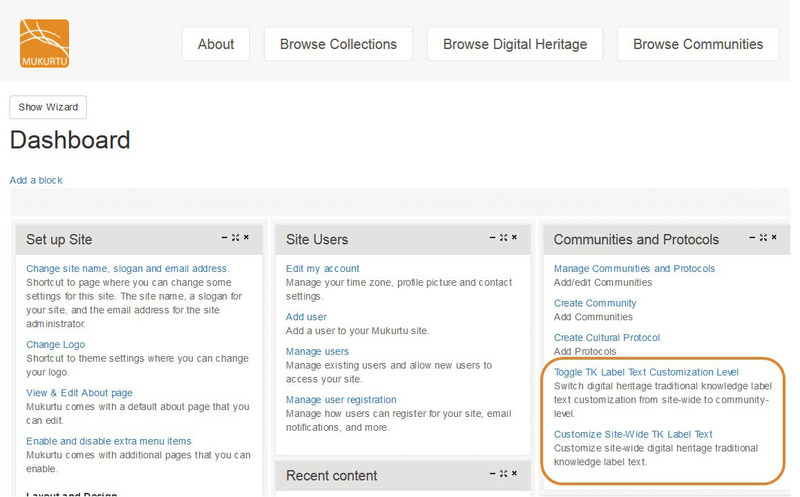 To switch to community-level customization, through the dashboard, select Toggle TK Label Text Customization Level: Switch digital heritage traditional knowledge label text customization from site-wide to community-level. 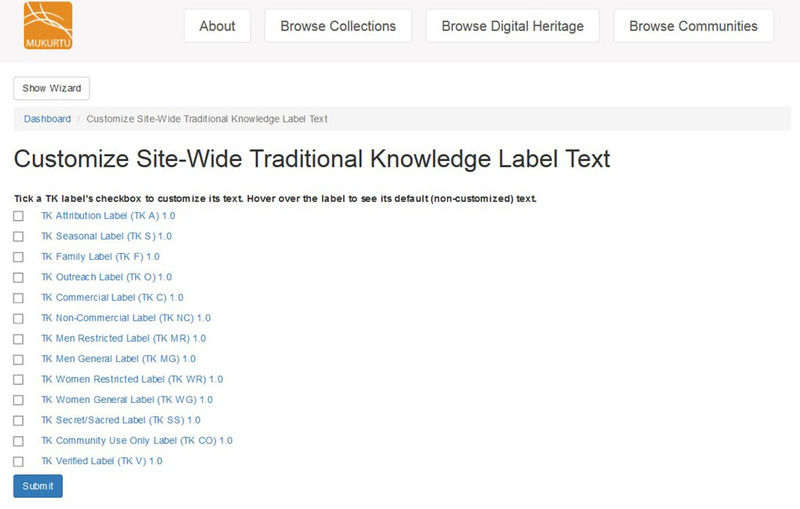 To switch back to site-wide customization, select Toggle TK Label Text Customization Level: Switch digital heritage traditional knowledge label text customization from community-level to site-wide. When toggling between site-wide and community-level label text, all your entered custom text will be saved, and will be available when toggling back. 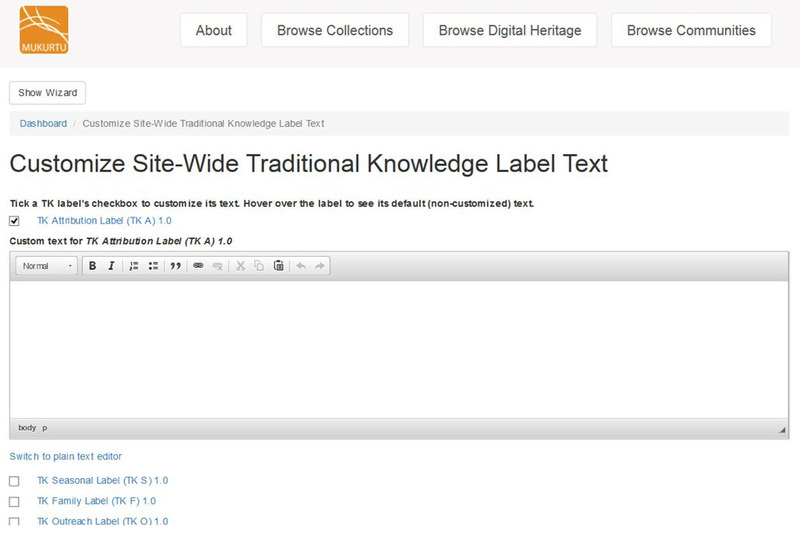 With site-wide customization toggled, to customize labels, select Customize Site-Wide TK Label Text: Customize site-wide digital heritage traditional knowledge label text and the following screen will appear. You can customize any or all of the labels by ticking the box next to the name of the label to be customized. The label will expand, and text can be entered in the box. Repeat this for all labels to be customized, and then click Submit. To revert back to the default label text, untick the checkbox(es), and the default text will be displayed. Your custom text is preserved, and you can simply tick the box again to display the custom text. 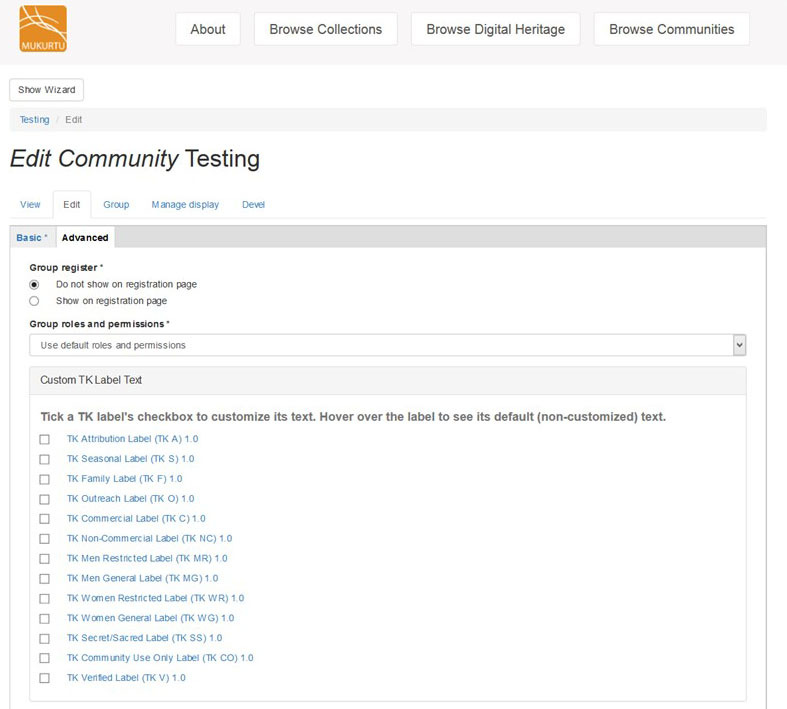 With the community-level customization option toggled, open a community to edit it, and navigate to the Advanced tab. From here the labels can be customized in the same way as site-wide labels - tick the corresponding box to open the text editor, then save when done.